With the endorsement of our skilled professionals, we are involved in offering a wide range of Vermicelli Extruder Machine to our valuable clients. The machine offered by us is manufactured using high grade components and progressive technology. Our offered machine is available in various models and other technical specifications based on clients requirements. Apart from this, this is designed in accordance with the certified market standards to provide maximum satisfaction to our clients. Our firm specializes in providing our prestigious clients with a quality array of Vermicelli Extrusion Machine. It is very well standardized and simple. Wheat and other flours in small quantity are mix with around 25% to 30% of water in a mixer for about half an hour and dough is prepared. It can prepared with help either dough mixer (vermicelli Flour mixer) :( this machine would consist of heavy-duty stainless steel body with multi-purpose arms. Heavy-duty gears are providing to take the full load and to avoid damage to the mixer arms) or by hand. The mixed dough is then put into a vermicelli extruder. 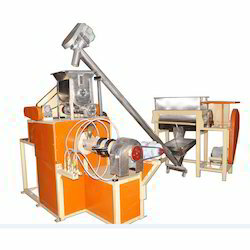 This vermicelli machine uses extrusion principles that will change the dough into vermicelli threads. This extrusion is carried out through small holes in the bottom part of the machine whose diameter can be adjusted according to usage. That is 0.5 mm, 1.6 mm and so on by changing the die. This vermicelli (sewai) making machine is run by electricity. This dough is passing through extruder and long rods of vermicelli come out from the extruder with fitted die 0.5 mm to 1.6 mm, which are cuts into the desire length and then placed in the tray drier for drying. Drying temperature is around 55-65 c and time required is 1.5 to 2 hours. Darien piece are weighing and packed in attractively printed polythene bag. The weight and process loss is around 10%.